STOP PRESS: VillageGuard® is now the UK's most popular insurance policy for Village Halls! Allied Westminster has teamed up with a RICS surveyor to bring a new solution to the old problem of under-insured Village Halls and vulnerable Trustees! At present, if Halls are under-insured then not only does it create problems at time of claim, but Village Hall Trustees can become personally liable for the uninsured losses. This problem can be avoided altogether if the Hall is insured for the correct sum, but Trustees are often unable to spend £500-£800 for a full onsite valuation so they can set their sums insured correctly. Allied Westminster has been tackling this problem for some years and has just launched its new initiative – The Property Rebuild Assessment Report scheme. Under this, Halls can now receive a highly detailed valuation report showing appropriate sums for all assets – main building, outbuildings, tennis courts, car parks, walls, etc – allowing them to set sums insured with great precision. The report is simple to request and quick to arrive. Better yet, it’s completely FREE to VillageGuard® clients in a 3- or 5-year arrangement with Allied Westminster, and heavily subsidised for those clients who aren’t. It’s even subsidised for Halls that aren’t even clients of VillageGuard, because Allied Westminster has a strong commitment to eradicating this problem for all Village Halls across the country. The report is indemnified for five years by Aviva for clients who use VillageGuard, and completely removes the problem of Trustee vulnerability for under-insured assets. Good news for 2019! VillageGuard® is now the most popular Village Hall Insurance policy is Britain! VillageGuard now used by more Village Halls than any other, and more Halls are coming on board every month. Its success is due to a combination of factors: it's designed by Village Hall people for Village Hall people (and word of that fact has spread rapidly) the premiums undercut the competition in most cases, and at our Boston Spa HQ we offer a personalised claims service which is fast and efficient. All but the larger claims are handled by our team of friendly professionals. Call us to find out more - 01937 845245. Allied Westminster Insurance Services (Allied Westminster) and ACRE (Action with Communities in Rural England) are delighted to announce we have reached an agreement to provide significant financial support for ACRE’s England-wide information and advice service for village halls over the next three years. This vital advisory service is delivered to village hall committees by the thirty-eight county-based organisations that, together with ACRE, make up the ‘ACRE Network’, and which will now benefit from Allied Westminster’s generous investment. Designed by Allied Westminster and underwritten by Aviva, VillageGuard® typically provides substantial cost savings because it's the only Village Hall insurance policy underwritten in favour of well-managed village halls in rural locations. Other insurers will provide insurance for Village Halls but only within a policy that also covers higher-risk buildings which are not Village Halls and which are not in truly rural locations. Such buildings carry higher risks that must be loaded into their premiums. At Allied Westminster we don't believe that you should pay for risks that don't reflect the location of your Village Hall. VillageGuard® excludes these higher-risk buildings, meaning lower premiums for genuine Village Halls in rural locations. Allied Westminster is a product innovator and a market leader in Village Hall insurance. Our VillageGuard® policy covers over £1 billion worth of assets for thousands of Village Halls throughout the UK, and has been a major success since its launch in 2006. Our Village Halls benefit from a personalised service which allocates a dedicated claims handler to every claim, minimising delay and inconvenience. Alternatively, email us with the renewal date of your current policy and we'll contact you with a quote at that time. 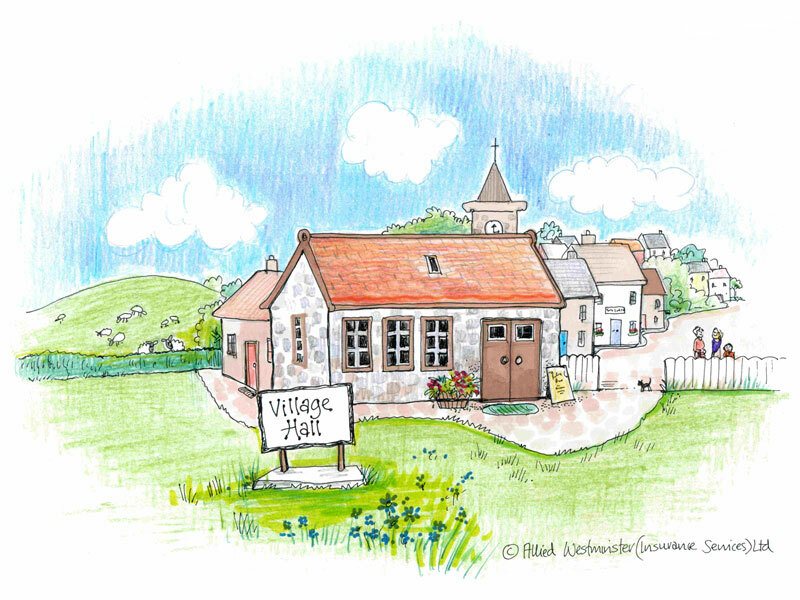 An EXTRA discount is available for those Village Halls participating in the Hallmark scheme from Acre in England, or via membership of the Keystone scheme in Scotland. Is your Hall accredited with either Hallmark or Keystone? If so, call us on 01937 845 245 to find out the size of your discount. The VillageGuard policy from Allied Westminster was the first insurance policy to recognise and reward Village Hall management committees who achieved the Hallmark standards 1,2 or 3. Please enter your name and phone number for a call back during office hours (Mon - Fri between 0900 - 1700). Village Hall Insurance, Community Hall Insurance, and rural Charity Insurance across the UK with our VillageGuard Policy..